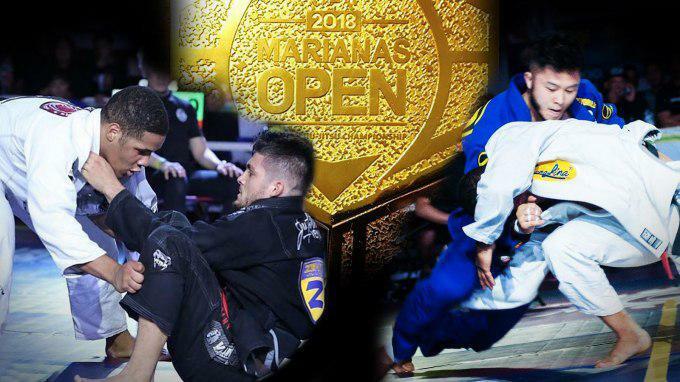 The brackets for the 2018 Marianas Open are out now and the first-round. The event—which goes down on April 22 is offering huge cash prizes for their elite black belt tournaments: a cool $10,000 for each division. The -181lb bracket features the return of 2017 Marianas Open champion Isaque Bahiense. Also vying for the cash prize are 2017 no-gi world champ Renato Canuto, UFC fighter Gilbert “Durinho” Burns, 2018 European silver medalist Masahiro Iwasaki, and more. A quick look at the bracket shows a number of crazy first-round matches, including “Durinho” vs. Iwasaki and Gracie Barra’s Servio Tulio (who won the brown belt division here last year) vs. Atos standout and word-guard specialist Andris Brunovskis. With an unlimited weight limit above 181lb, the heavyweight division has attracted big names such as 2017 champion Felipe Pena, who returns to claim gold once again. Also in are 2017 no-gi world champion and 2018 European and Pan champ Lucas “Hulk” Barbosa, as is 2018 Pan silver medalist Mahamed Aly, 2018 London Grand Slam champ Jackson Sousa, and 2018 Pan silver medalist Tanner Rice. First-round matches to watch out for include Rice taking on Hong Kong-based black belt Viking Wong in his opening match, while on the other side of the bracket Jackson Sousa and Mahamed Aly will go head-to-head in their first matches.